First up, a limited red edition of the wearable Mega Man helmet. It comes inside a decorative box, perfect for display when not in use. 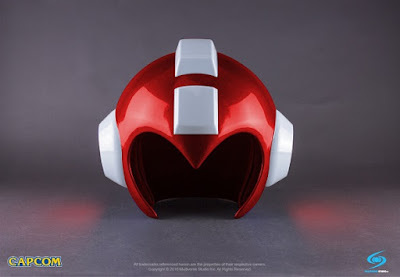 Much like the previous helmet replicas, this one features LED lights on the side powered by two AAA batteries. It will set you back $170, limited to 800 units. 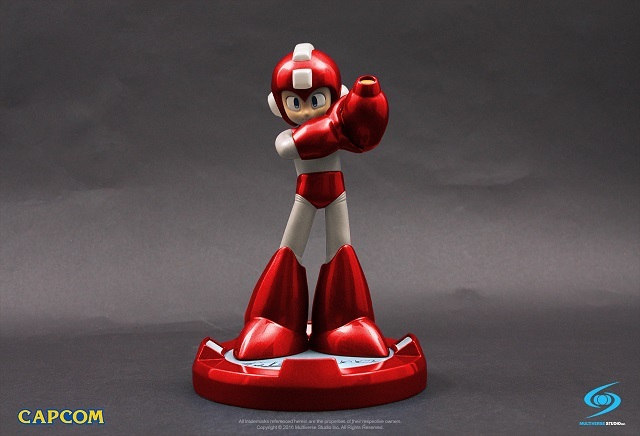 Second, the popular USB-powered Mega Man statue is back again with a fresh coat of red paint. This is the same mold as the 25th anniversary version, with light-up helmet, buster and base. It's limited to 600 units, going for $170. As a reminder, TruForce will also be selling the X-Boost Mega Man X figure, too. Soooo... money. Bring lots of it. Just like Inafune always wanted. I'm sure we will be looking at quite a few after the con. I'm in the process of making a "correct eye" decal for the light-up statue that I have. Drives me nuts!